The saker acquired by the Jamestown-Yorktown Foundation was made by Thomas and Richard Pitt, probably during the reign of King James I. 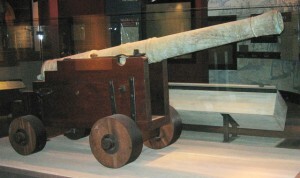 A recently acquired Jamestown-era bronze cannon is now on exhibit in the “Establishing Jamestown” section of the Jamestown Settlement galleries. Made in England early in the 17th century, this long-barreled cannon is of a type called a saker. John Smith mentions “sacars” when he lists the guns present at James Fort in 1608. Cannon balls of a size suitable for sakers have been found not only at Jamestown but also at Martin’s Hundred and Flowerdew Hundred, two other Virginia Company settlements. The Virginia Company of London assumed that its settlements in the New World would need to defend themselves and consequently sent a considerable number of artillery pieces to the colony. At one point James Fort had 24 cannon mounted inside its walls. The guns were all of relatively small caliber, firing cannonballs weighing 18 pounds or less. The two most common types of Virginia Company-supplied guns were the saker, which fired a ball weighing about five to six pounds, and the falcon, an even smaller gun that fired a two-and-a-half-pound cannonball. The main difference between the Jamestown-Yorktown Foundation’s saker and the guns that were in common use in early colonial Virginia is that it is made of bronze rather than cast iron. Bronze guns were lighter but more expensive than iron guns, and most English bronze cannon were made under royal commission and mostly used on royal warships. Even the English crown didn’t use bronze guns in coastal fortifications, where the greater weight of cast iron guns made little practical difference. We can assume that the Virginia Company, which always sought to buy supplies and equipment as cheaply as possible, preferred to purchase iron guns. Most of what we know about the Foundation’s saker is told to us by the gun itself. An inscription on the barrel indicates that it was made by Thomas and Richard Pitt. Thomas and Richard were brothers, the sons of Henry Pitt, a royally appointed maker of bronze guns during the reign of Queen Elizabeth I. Henry Pitt’s foundry continued to supply guns to the crown during the reign of King James I, with his sons gradually taking over the business and continuing it through the reign of King Charles I. A Tudor Rose insignia on the barrel of the saker. 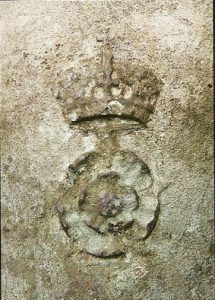 A Tudor rose insignia on the barrel of the saker could mean that the gun was made before the founding of Jamestown, since the Tudor rose is particularly associated with the reign of Queen Elizabeth I. However, while the Tudor rose certainly appears on guns made in Elizabeth’s time, it also turns up on some royal guns made as late as the reign of King Charles I. There is no evidence to indicate that Thomas and Richard Pitt were making guns on their own as early as 1603, the year of Queen Elizabeth’s death. It is more likely that the Foundation’s saker was made during the reign of Queen Elizabeth’s successor, King James I.The earliest gun known to have been made by Thomas and Richard rather than their father Henry Pitt is dated 1608. This was a special, highly ornamented presentation piece given to Prince Henry, the son of King James I. Richard Pitt seems to have left the family business by circa 1630, but Thomas Pitt continued to make guns until his death in the 1640s. Thomas continued to enjoy royal favor under King Charles I. In 1639 Thomas Pitt made a set of five miniature guns for presentation to Charles, Prince of Wales, later to reign as King Charles II of England. These guns form part of the collection of the Royal Armouries, United Kingdom. Only a handful of guns made by the remarkable Pitt family, royal gun founders to three successive English monarchs, have survived to the present day.